Taking one final look back at 2018 reminded us of several interesting highlights. The year featured a return to more normal levels of volatility after one of the lowest volatility years for stocks on record in 2017. Point to point (beginning to end), an investor looking at 2018 would likely say that it was a relatively uninspiring year, with the S&P 500 down 4.4% and bonds (as represented by the Bloomberg Barclay’s Aggregate index) flat. However, an investor who frequently checks on the market (as almost all of us did) had a much different experience. At the beginning of the year, the Dow fell 1,175 points in a single day (4.6%) as fears of higher bond yields, increasing inflation and even a mini “Flash Crash” permeated the markets. The market declined 10% overall before reversing course and steadily marching higher. The S&P 500 (U.S. large cap), the NASDAQ (tech heavy), and the Russell 2000 (U.S. small cap) hit record highs during the third quarter of the year. The tech giants that populate the NASDAQ in particular were generating large amounts of investor interest, with many of those familiar names reaching record highs in conjunction with the overall indices. The widely followed S&P 500 peaked on September 20, closing at an all-time high of 2930.75. The almost decade-long bull market felt intact. Much of that changed in the fourth quarter as just about every sector and segment of the global stock market declined sharply, with many falling double digits. The worst performing segment was the Russell 2000 (domestic small cap stocks), which declined 20.2%, slightly more than the level considered a bear market. The benchmark S&P 500 declined 13.5% in Q4. The broad-based declines were attributed to the ongoing trade and tariff negotiations and fresh concerns over the trajectory of global growth spurred by tighter fiscal and monetary policy. The Dow Jones Industrial Average and S&P 500 delivered their worst-performing Decembers since the Great Depression. Domestic stocks ignored strong historical seasonal precedents that typically show gains at year-end and after mid-term elections. 2018 was the first time in history that stocks finished lower after being up the first three quarters of the year. In a typical risk-off environment, emerging markets perform poorly on a relative basis. Emerging markets held up better in Q4 than domestic and international developed stocks. We are 10 years past the global financial crisis, but the fears linger and are inflamed in periods of volatility and weakness. Will it happen again? What would spark another meltdown? Could this one be worse? None of us know the answer to that question, but it did get me thinking about 2008 and 2009 and some of the lessons we learned. In no particular order, here are a few things to keep in mind as we work through this volatile period. Markets tend to perform like pendulums at extremes, often overshooting “fair value” for a period. Trying to time a correction or bear market is exceedingly difficult, requiring multiple correct decisions: when to get in and when to get out. Investors that stuck with their long-term plans prefaced on long-term goals and using long-term and relatively simple strategies (asset allocation, rebalancing, etc.) recovered from the weakness. Markets tend to be mean reverting: above average returns after a period of below average returns and vice versa. The worst bear markets happen during recessions. From a pure valuation perspective, the sharp declines at the end of last year removed some of the more extreme valuations. Foreign markets in particular are below long-term averages from most simple valuation metrics. From a market and economic perspective, growth remains on less-stable footing and volatility is back to more normal levels. These are areas to watch, but they don’t lead us to believe that we are returning to a period similar to the 2008 and 2009 market environment. The yield curve inverted for the first time since the 2008-2009 financial crisis. This was driven by rising short-term rates controlled by the Federal Open Market Committee (“Fed”) and falling long-term rates influenced by bearish investors. Fixed income posted mixed results in the fourth quarter as equity volatility rose. Non-investment-grade bonds lagged as concerns around credit quality and the drop in oil prices impacted most high yield issuers. Equity markets globally were under pressure as trade negotiations continued to stay in focus and fresh concerns arose that economic growth may slow amidst tighter monetary and fiscal policy. To the surprise of many investors, emerging markets held up better in the risk-off environment during the fourth quarter. A weaker U.S. dollar in December, lower valuations and company specific news contributed to outperformance. Commodity indexes were influenced heavily by the drop in oil prices. The market was surprised by the additional supply resulting from the lifting of sanctions on Iran. MLPs retreated in the fourth quarter amidst souring energy-related investor sentiment and a number of corporate actions taking place in the space. Real estate fared the best among real assets, but was not immune to the risk-off move in markets over the fourth quarter. Third quarter real GDP came in at an annual rate of 3.4% according to the Bureau of Economic Analysis, a decrease from the rate of 4.2% during the second quarter. Aside from last quarter, this was the strongest quarter-over-quarter growth since the third quarter of 2014. The Fed voted to increase its benchmark rate by 25 bps to a range of 2.25 – 2.50% during its December meeting. This was the fourth interest rate hike in 2018; the Fed reduced its forecast for 2019 rate increases to 2%, down from 3%. Core CPI rose 2.2% (YOY, seasonally-adjusted) in November while Core PCE, the Fed’s preferred measure of inflation, increased 1.9% (YOY, seasonally-adjusted), falling short of the Fed’s 2% target. China’s official Manufacturing Purchasing Managers’ Index (PMI) declined in December to 49.4. This level is indicative of contraction and is the lowest level since February 2016. The unofficial Caixin/Markit PMI, a private survey focused more on small- and medium-sized businesses, also declined to 49.7 in December from 50.2 in November. 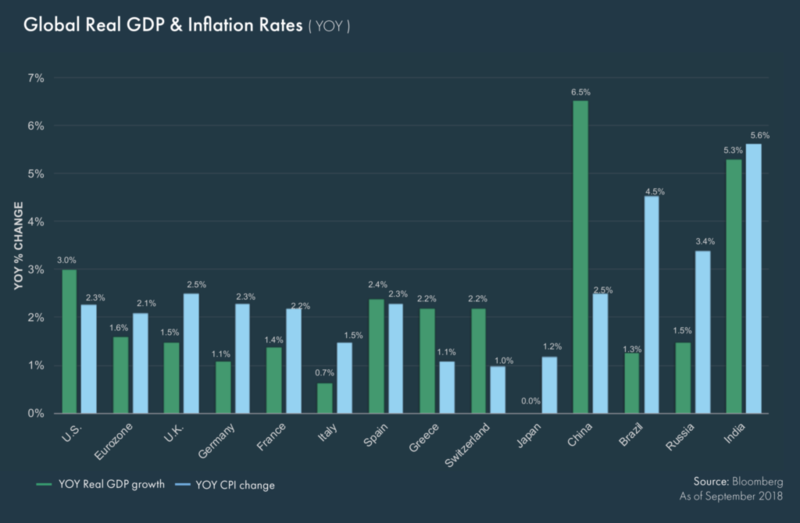 The World Bank reduced its forecast for 2019 global GDP growth to 2.9% and cited increased trade tensions as a factor that could further negatively impact the economic outlook. Germany, the largest Eurozone economy, is at risk of falling into recession as real GDP declined 0.2% in the third quarter. German industrial production declined 1.9% month-over-month in November, its third consecutive monthly decline. This increases the chances of another quarterly decline in real GDP in the fourth quarter. French real GDP growth in the third quarter fell short of expectations and only increased 0.3% quarter-over-quarter, further compounding fears of an economic slowdown in the Eurozone. Interest rates continued to exhibit heightened levels of volatility. Treasuries rallied as the 10-year fell nearly 40 bps to finish the quarter at 2.68%. Riskier parts of the domestic fixed income universe–such as U.S. high yield–fell. Given the route in equity markets, investors placed an emphasis on upgrading the quality of their portfolio. The U.S. dollar continued to appreciate relative to most global currencies. As a result, hedged strategies within non-U.S. fixed income outperformed unhedged and emerging strategies. Despite political rhetoric from the White House, the Federal Reserve increased its target rate again by 25 bps to 2.25-2.50% following the Fed’s December meeting. Recession signals flashed during the quarter as the yield curve inverted between the 2- and 5-year Treasuries. Following the intermediate term inversion, a sell off in risk assets resulted in spread widening within high yield. Breakeven inflation fell to 1.7% as TIPS vastly underperformed Treasuries for the quarter. Within U.S. equities, value stocks held up better than growth and large capitalization stocks better than small cap stocks during the volatile fourth quarter. Energy was the worst-performing sector as oil prices slid. Utilities outperformed as investors rotated into less cyclical sectors. Similar to domestic equities, international equities fell. Developed markets fared worse than emerging markets as political developments in Brazil and positive returns in India boosted index returns in the quarter. The risk-off mentality was seen across all international developed markets. Similar to domestic markets, utilities outperformed while energy, technology and industrials lagged. Investors will be keeping an eye toward Brexit developments and upcoming election cycles among a number of other European countries. Real assets were broadly negative in the fourth quarter as risk aversion took hold within financial markets. REITs outperformed other asset classes as multifamily REITs and healthcare REITs proved resilient. Hospitality underperformed, reflecting that the sector is generally more sensitive to economic and equity market sentiment. Energy fell sharply during the quarter, stemming from a decline in crude prices. Additional supply resulting from sanctions being lifted on Iran surprised the market. Natural gas, which was flat for the quarter, helped offset a portion of the decline. The same is true of precious metals, which were higher in the fourth quarter. MLPs declined as a combination of tax-loss harvesting, corporate transactions and risk aversion negatively affected the asset class. Despite the equity market reaction, pipeline volumes, cash flow growth and balance sheets continue to strengthen in the space. The HFRI Fund Weighted Composite Index was down during the fourth quarter, but protected capital better than the S&P 500, MSCI EAFE and most risk assets. 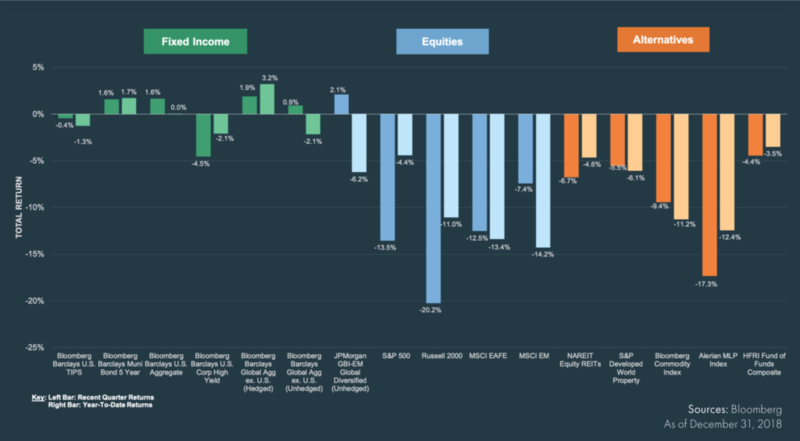 As expected, Equity Hedge strategies underperformed the broader hedge fund universe, with losses concentrated in the energy and materials-oriented strategies. 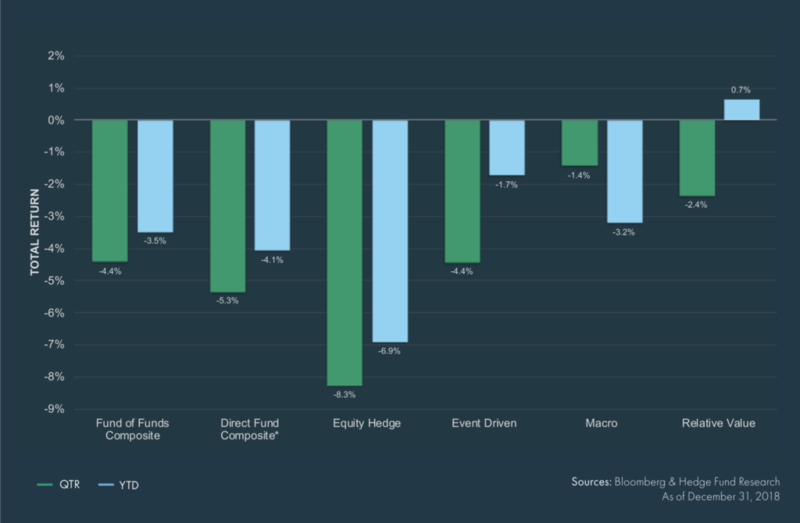 Event Driven strategies modestly outperformed the broader hedge fund universe, with activist managers trailing the broader group while Multi-Strategy funds within Event Driven fared well. 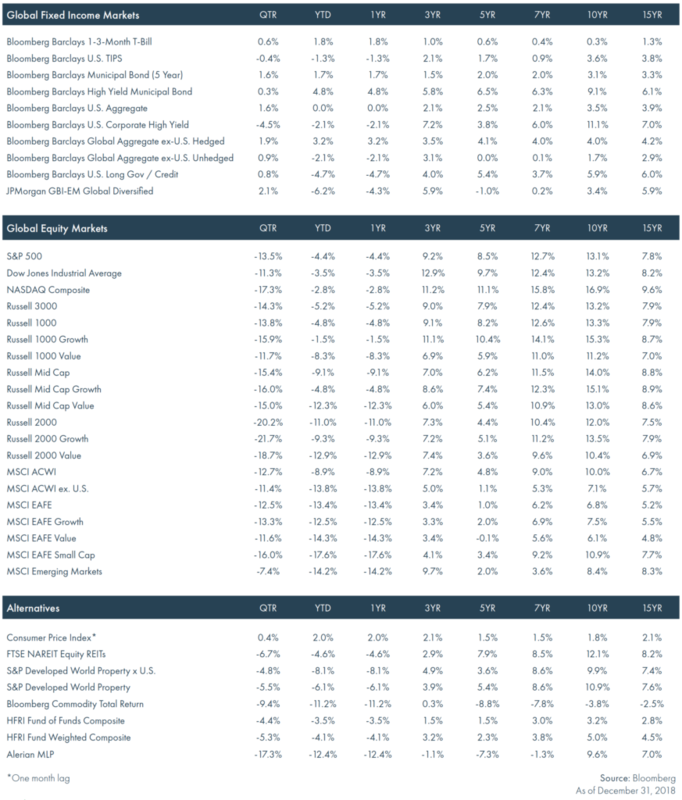 Macro strategies were the strongest performer during the fourth quarter amongst the broader hedge fund universe as systematic strategies exhibited strong downside protection. 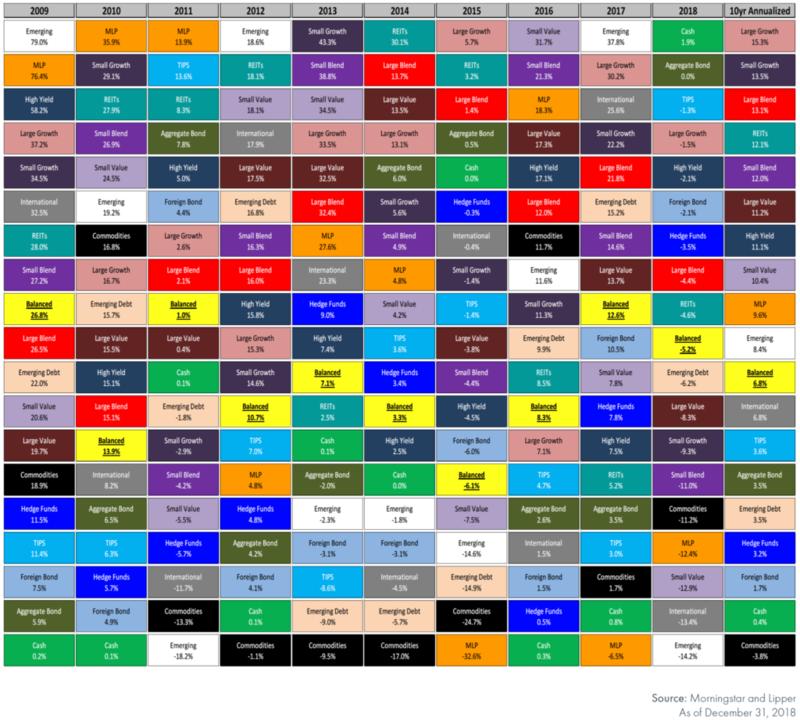 Relative Value also outperformed the broader hedge fund universe, led by relative-value multi-strategy managers and volatility trading strategies. Periods greater than one year are annualized. All returns are in U.S. dollar terms. These materials have been prepared for informational purposes only based on materials deemed reliable, but the accuracy of which has not been verified. Past performance is not indicative of future returns. These materials do not constitute an offer or recommendation to buy or sell securities, and do not take into consideration your circumstances, financial or otherwise. You should consult with an appropriately credentialed investment professional before making any investment decision.